We already showed you how to make zombie cupcakes (actually I just gave you a link to the actual instructions, but you know what I mean). 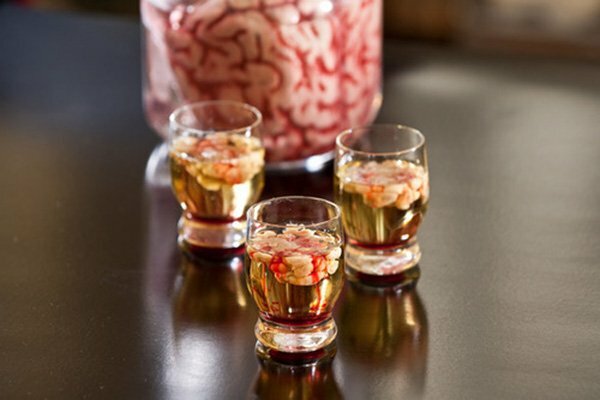 Now here’s the perfect partner to that brainy pastry – the Bloody Brain Shooter. The brain-like goo in this case is just Bailey’s Irish cream. It ends up like that because the drink itself is vodka mixed with lime juice. The lime juice causes the cream to curdle a little and voila – Baiiiiiiiileeeeeeeeeeeeyssssss. Drop by Fine Living for the complete recipe and instructions on how to make this gross undead drink.